You want a Website that attracts attention. You want viewers who will react and respond to what they see. Our CMS Development Team are experienced, skilled and equipped to provide you with an attractive, engaging website that will entice and engage your visitors interest and encourage them to take action. The CMS Development Team will do this for you having fully analysed your requirements and assessed your needs. Our WordPress Development Team will take provide for you with a responsive, impressive, rich, client-attracting, website that will be structured to impact on your target audience and generate traffic and leads. WordPress offers a wide range of themes and plugins and you will be guaranteed a high-performance website which you will be proud to own and use to show-case your business, your organization and your services. 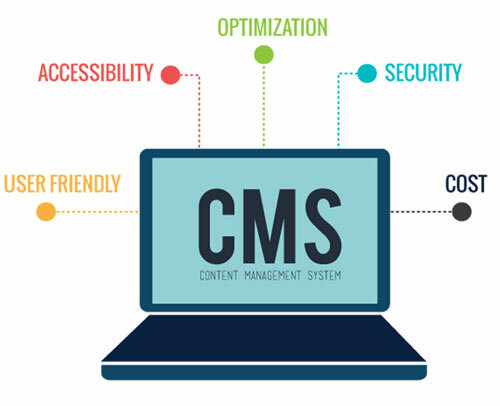 Our Content Management System Design will help distinguish your cms website from the competition and will be configured to target the audience of your choosing. Our CMS website developers have the required knowledge, experience and expertise to create, develop and configure yours website so that it will attract the attention online of your target audience; inspire them to engage and encourage them to take action. It will help you to attract more clients, customers and supporters; increase transactions and help you grow your business. For further information and assistance call our CMS Web Development Team. They will be pleased to guide you and to discuss your options. Magento is powering more than 200,000 e-commerce stores across the globe. Creating a website on Magento can help the businesses in setting up their online store on an e-commerce company and offer a hi-end shopping experience to all the site visitors. We provide a highly customisation, attractive, and feature-rich Magento site that is easy to run and scale. Drupal is one of the most flexible and powerful CMS in the world. It has diverse features to meet the specific needs of different businesses. Whether it is a personal website, e-commerce store, corporate website, personal blog, or any other online platform, we can develop a highly engaging Drupal website. Joomla is an ideal content management system that is powering millions of websites today. Working in more than 64 languages, Joomla can be used for developing websites that cross all linguistic barriers. Our Joomla web developers develop Joomla websites that can monetize the online presence of any business through its powerful capabilities for promotions. WordPress is one of the most popular and powerful content marketing systems in the world today. It has thousands of themes, widgets, and plugins that offer ease of customization of website as per the business needs. Our CMS web developers focus on your requirements and come up with a WordPress website that is dynamic, responsive, SEO-friendly, flexible, and scalable.